Is there any hope of this ever being enacted? Does anyone else get completely sick of widespread opposition to changes that improve society as a whole by shifting rights a smidgen in favour of vulnerable groups? society has a history of not wanting to improve the rights of vunerable/minority groups unfortunately. Yes, there is a hope. As I understand it, Julie-Anne Genter is clued up about the dire state of pedestrian priority and amenity. It seems there are proposals to change the land transport rules to improve the safety of vulnerable users at intersections, amongst other things. 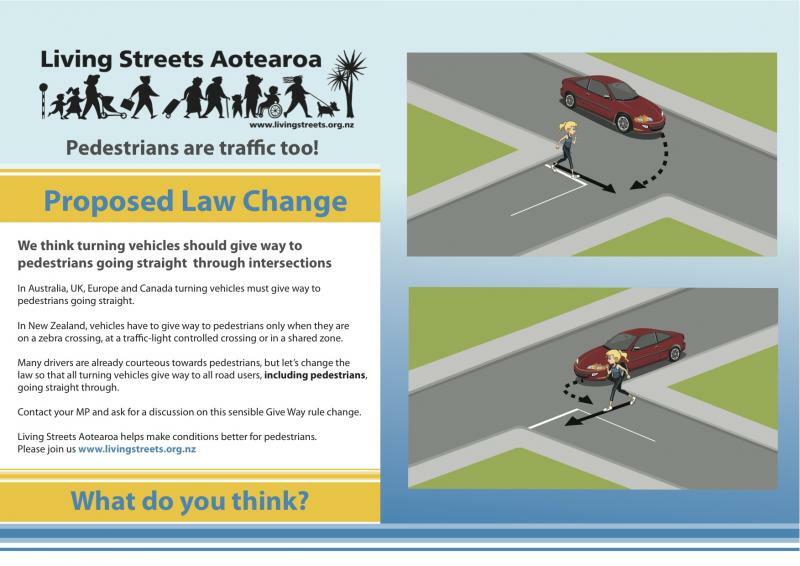 Removing the “Pedestrians give way to vehicles” signs from Henderson and Ranui would help. I recently spent a week in Sydney. I was amazed at how quick to the brake motorists when I approached a Pedestrian Crossing. Somehow I thing that the Police in NSW have different priorities to NZ Police. Agree. These signs have trained drivers to ignore pedestrians standing at a “pedestrian crossing – like” crossing. There was plenty of guidance in international safety literature from the 90’s about the way that drivers learn from the driving culture around them. The decision to start installing these seems to have been made around 1994. I think that decision was made in a vacuum of focus on vulnerable users, and in a vacuum of competency around safety. Continuing to allow these devices is unforgiveable now that Safety is our Top Priority, and Austroads says that the design must start by focusing on the vulnerable user. using petone -nguaranga as an example, if we are focussing on vunerable users does that mean we mighy see immediate temporary modifications to the highway hard shoulder as the approved shared path is five years from completion? If safety is our top priority why aren’t we spending large to fix the problems? If we look at following Vision Zero it requires a huge amount on money to be spent making roads safer. This would be a great law change. This also needs to extend to driveway. Cars moving in and out from their private driveways should always give way to pedestrians. At the moment it is kind of a grey area and cars sometimes should speed in and out from driveway. This is a big problem when the visibility is blocked by trees or concealed exits with low setbacks. If I recall correctly, legally there is no grey area. Vehicles on a driveway crossing a footpath must yield to pedestrians walking along the footpath. And, by the way, the legal status of land as footpath or driveway is not affected by the fact that someone may have built a kerb across the footpath. Correct me if I’m wrong. Yes legally it is very clear — but you’re going to end up in hospital just the same. What I also wonder is why is it legal at all to build kerbs across a footpath. 1. Public awareness education – Like an TV Ad saying how a crossing pedestrians get hit by car going though driveway and the driver get caught and jailed.